Telecommunications professor Steven Grant stands in the middle of a 64-speaker surround-sound audio battlefield in Rolla, Mo., Friday, Feb. 18, 2011. 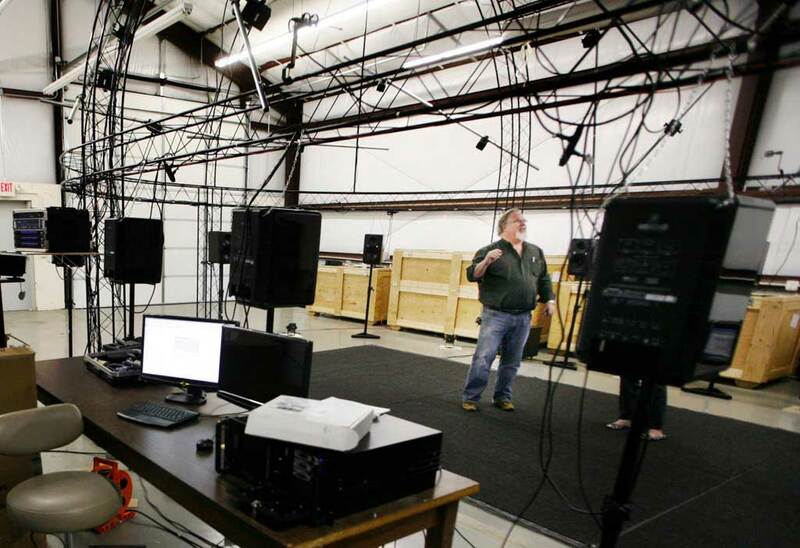 In an effort to help prepare troops for combat’s auditory assault, researchers are turning a nearby warehouse into a surround-sound audio battlefield that they hope military trainers could soon use. Seems like a great idea. On a side note, if I was starting a death metal band i’d call it “Audio Battlefield”. Forget training soldiers for the battlefield, that thing could make you the ultimate “Who farted” machine! That will definitely help considering how loud guns can be and especially the guns used in the army. On a side note, that would be an epic band name. Instead of spending megabucks on a sound system, why don’t they just do some shooting at the range without or with lesser ear protection?